Mitsubishi Electric announced today it has developed a high-voltage integrated circuit (HVIC) to drive power modules equipped with AC400 V-output inverter systems for use in Europe and elsewhere. 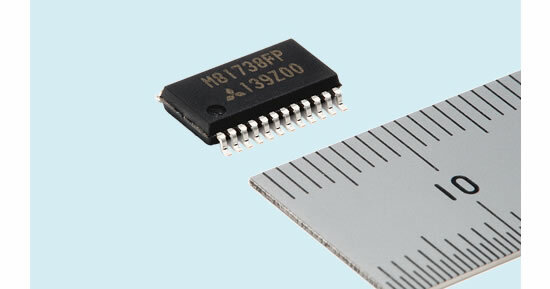 The M81738FP boasts an industry- leading 1,200 V rating and high tolerance to switching noise. Variable frequency inverters are being used increasingly in motor control systems of consumer appliances and industrial machinery to save energy and improve performance, which is leading to more demand for HVICs that drive power modules in inverter systems. For AC400 V inverter systems prevalent in Europe and other places, high-voltage HVICs are required. Mitsubishi Electric, which released a first-generation 1,200V HVIC in November 2005, has now developed a second-generation 1,200V HVIC that helps to improves the reliability of AC400 V inverter systems. Sales begin on April 2.